We have just completed our first overnight cycling trip, a round trip of modest mileage from our home, and an overnight stay in the campsite at Grendon Lakes. We packed up our tent, sleeping bags, mats and little cooker in our panniers and in the back of our bike trailer and set off yesterday afternoon, a little anxious about whether we were fit enough to pull off cycling with all our gear and the trailer. We made it! That's the good news. The girls were comfy in the trailer- both went to sleep for most of the hour we spent cycling to get to the campsite. The grown ups were rather more exhausted than we might have liked, but we gain some confidence from getting our first fully loaded ride under our belts. Our stuff is too heavy! 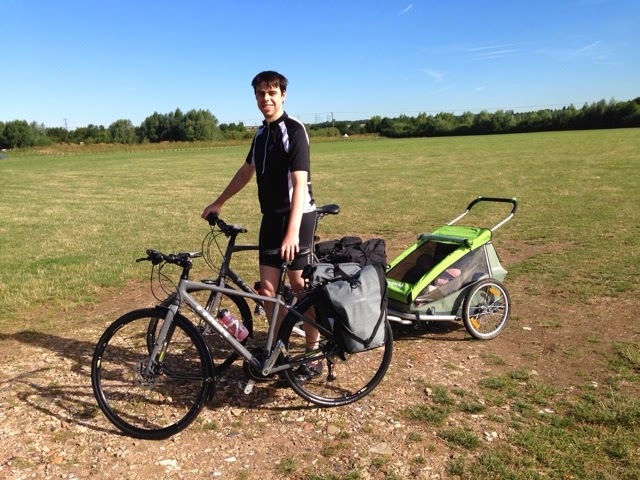 Having completed what was only a short ride, we are both agreed that it is time to get a little more obsessive about weight saving. We need to do some work on the weight distribution. With the trailer on the back, we need to move some of the weight from our rear panniers to the front of the bike. We need to run the pressure on our rear tyres higher than we thought to cope with the extra load when the trailer is on the back. Even with small children, you don't need much stuff at all to be totally self sufficient. We are not as fit as we need to be to really enjoy this yet! 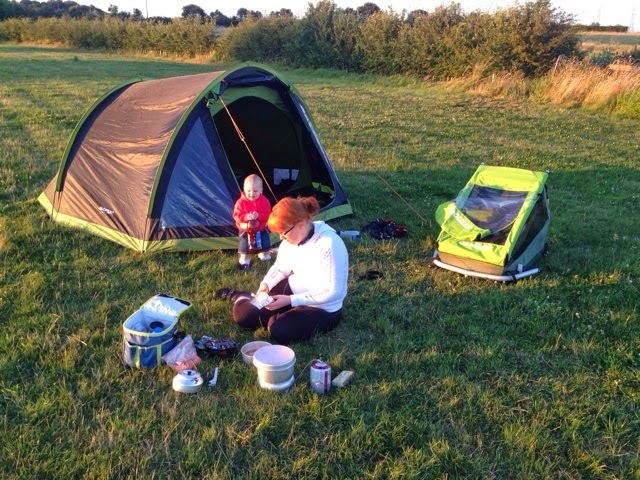 Grendon Lakes was a nice, no frills, overnight spot: we had a huge field all to ourselves (which turned out to be a very good thing, as Ruth was sick several times in the night, and we were therefore not the quietest of campers!) with a short walk to the toilet and shower block. With Ruth poorly, we packed up quickly in the morning and headed home without spending much time investigating what else Grendon Lakes has to offer. Once we are all recovered from last night, we're looking forward to making some changes to what we pack, and getting out again for our next adventure.